We’re delighted to share a scientific paper written by ASL Senior Scientific Officer, Dr. Joey DeCourcey. 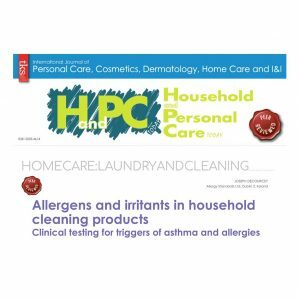 The article titled “Allergens and irritants in household cleaning products” reviews the recent clinical studies that assessed trigger factors in cleaning products in a domestic environment. In particular, the article discusses asthma intervention studies that involve cleaning regimes, and the choice of cleaning products that are used. With an increasing trend towards transparency in cleaning product formulation it is important for consumers to be aware of individual ingredients that may act as asthma and allergy triggers on sensitive individuals. Companies should also be aware of their products impact on indoor air quality, and ultimately on the consumers health. There is a need for further research to identify the sensitising components of these products and to recognise that the recent trend in eco-friendly formulations may not be necessarily be resulting in Human-friendly products. Guidelines for asthma management recommend regular cleaning regimes for pest control and removal of allergens such as dust and pet dander from the indoor environment. Many cleaning products on the market however contain irritants and allergens that may aggravate symptoms in sensitive individuals such as those with asthma and allergies. Epidemiological studies have identified a link between cleaning products and respiratory symptoms, however there are few clinical studies that assess the effect of specific ingredients in cleaning products. This paper will review the effect of cleaning products on individuals in a domestic environment through specific inhalation challenges. Furthermore, asthma intervention studies that involve cleaning regimes and the choice of cleaning products will be discussed. Innovation in green and eco-friendly formulations may not necessarily equate to a “human-friendly” formulation. More awareness and research is required in order to assess the impact of cleaning product formulations on an inhabitant’s indoor air environment, and ultimately their respiratory health.